Two words for surviving a weekend with omnivores: plan ahead. I worked with my BF's mom prior to the trip, in hopes of finding out what people were planning to cook, so I could try to "blend in" as best as I could. For instance, Saturday's meal was scheduled as "burgers and brats" so I took along a veggie patty for myself. But, to be on the safe side, I also made sure to bring along a few extra, easy-to-cook back-up meals... just in case. I took two Tasty Bite meals as well as some Luna bars, apples, bananas, peanuts and gingersnaps. Saturday's scheduled burgers and brats actually turned out to be beef stew. :( So much for my veggie patty. :( I was even more glad that I brought along the Tasty Bite meals now, and happily heated up the Bengal Lentils, which worked out extremely well for that particular meal because the bread provided for the meat-eaters stew proved to be most excellent for dipping in the lentil mixture as well. :) And, I can happily report that this dish looked WAY more appetizing than the stew the omni campers were stuck with. Before digging in, my BF looked at my bowl of yummy lentils then back at his bowl of gross-looking stew and said, "Wanna switch?" LOL Two thumbs up for Bengal Lentils!!! I'm definitely a big fan of these meals now. They taste good. They are super easy to cook. And they can make camping easier for veg*ns.... or any meal. I now keep a few pf these in my desk drawer at work in case I forget to prepare a lunch at home or don't feel like going out to lunch (see pic in this post... today's lunch! LOL). Since they don't need refrigeration, they're perfect for this purpose! I have another camping trip coming up in two and a half weeks; my BF and I will be roughing it in Porcupine Mountain Wilderness State Park in Michigan's beautiful upper peninsula. Last year, we went to Great Smoky Mountains National Park, which feels like a second home to me because I've done so much hiking there in the past five or six years. For our weeklong trip last fall, we relied solely on Lipsmackin' Vegetarian Backpackin' as our bible for easy veggie meal prep in camp. (My BF, who is omni, goes veg for the week we camp... isn't that cool?) This year, I'm also using a cool new book I ordered from FreezerBagCooking.com. I plan to blog a bit more about veggie hiking/camping as the trip nears... so watch for those posts soon! OMG, Tasty Bite saves my work day! I order online and get it delivered right to my office. 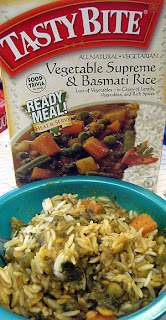 :) Bengal lentils are my favorite, but have you tried the new Kerala Vegetables and Multigrain Pilaf? Both are veg*n and DELICIOUS, I even have my boss eating TB.